Autoload can automatically import the complete 3D vessel database from any system used for vessel design. Advanced (Nurbs – Iges) surface import features are developed to meet the increasing request for Autoload in the market . We now can offer even faster , still reliable deliveries , also including preliminary versions at an early stage of the design process. Designed to meet IMO loading computer requirements, and type approved by DNV and Lloyds, also for direct damage stability calculations, Autoload enables vessel operators to perform accurate stability and strength calculations for any vessel loading condition. All calculations are performed from first principles, ensuring that results are as close to real life as possible, including true shift of load in slack tanks, damage, wind, grounding, water on deck, crane operation, any possible “what-if” scenario. The Screen interface is designed to give the operator a full overview of the vessels status due to stability and strength margins, ship load and reserve capacity. Profile, body, plan and 3D view show vessel floating positon aswell as tank loads and deck / fixed loads..
Maxvcg curve with margin, longitudinal strength curves and margins, drafts survey-, wind- , ballasting sequence-, auto-ballasting-, etc. are readily available from the main user interface through a selection of tabs. The Autoload screen interface is a result of more then 20 years of experience with Windows programming and design of true windows application, always using the latest available programming tools on the market. .
Autoload with dual screen (recommended). 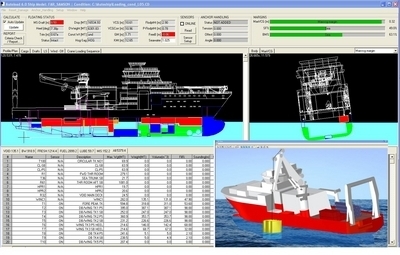 The Autoload deck cargo and crane handling module were implemented into the Autoload offshore vessel version as a plug in module in 2005. This module is a compressed version of our SPS program (ship planning System), developed over 10 years for roro fleets like Wallenius Wilhelmsen. The booking list in the offshore version has until now been based on manually input, but can be interfaced to the vessel operators booking system. The tools were developed, and implemented for the Roro fleets 5 years ago. Drag and drop cargo from booking list, draw your own cargo shape, save it in drop down library for later use, the possibilities are endless. Yet intuitive and easy to use. The cargo on deck will even be included in the vessels projected wind area. Crane is controlled by mouse. Right click control the knuckle (telescope) angle, left click control the slewing and topping angle. The crane capacity is also controlled, and of coerce stability criteria’s for sudden drop of load. With the crane loading sequence planning window user can generate a detail plan for a heavy crane lift, and then run 3D “video” of crane lift by stepping trough the pre planned steps. The steps in sequenced can be automatically calculated by the Autoballast function. The Autoballast function find required amount of ballast based on input target draft, heel and trim. Check of longitudinal strength and general stability criteria’s (minimum GM) is built into the auto ballast logic. And finally, the crane can be online, to monitor real time crane lift and also send the planned steps for a crane operation to ballast system (already delivered to several vessels). Include NMD Anchor handling stability criteria’s. Draft survey, by draft sensors or manually observed drafts at marks. Permits different harbor water densities.